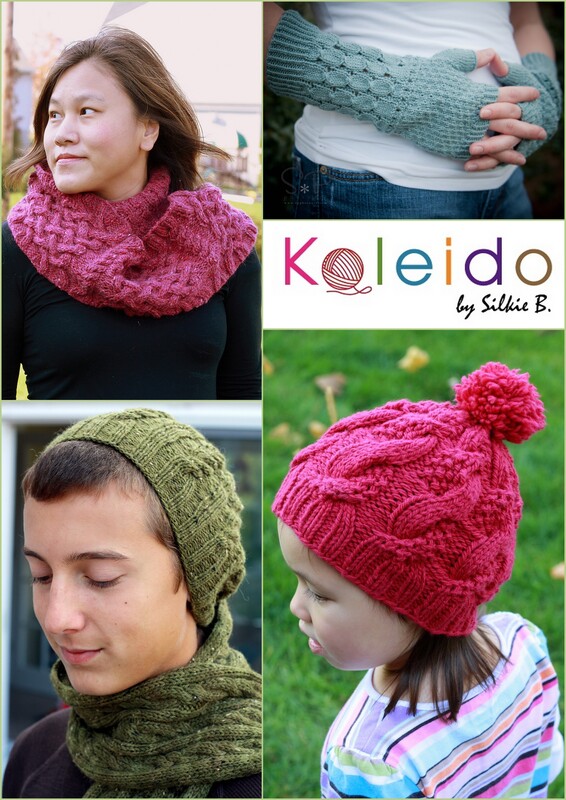 fingerless mitten knit pattern | Kaleido by Silkie B. To jump start your holiday gift knitting projects, I have put all my patterns on sales at Ravelry. From Now till Nov 15. You get a dollar off every patterns! Simply go to the my patterns page and click on any pattern and click ‘Buy Now’ image. Or if you are at Ravelry, look up ‘Silka Burgoyne’ and go to my design page or simply click on the Ravelry link. NO COUPON NECESSARY! As I am working on the new Accessory Collection for year 2012. I decided to combine 4 of my accessory patterns that I designed last year and created an eBook. This publication is currently available for sales in Ravelry.com in a discounted price. You can still however buy each individual pattern separately. Maneisha is the very first design I have created for my Accessory Collection 2011. Maneisha is a fingerless mittens design that combined Eyelet Cable Rib and a texture stitch. I wanted to create a design that is fun for experienced knitters and also fun for beginner who would like to experience working on cable and lace and using magic loop method. A little cable beanie design for both kids and adult. Please don’t be fooled by the cover, the pattern for this beanie has adult sizing! Hannie features allover double texture cable motif and it is perfect for both gender. Knit in heavy worsted weight or bulky yarn and it will definitely keep you nice and cozy in the winter. Hannie knits up quickly and will be a perfect gift for the holiday. Serena is a cable cowl that is a perfect accessory for the cold weather. It is also a perfect gift for someone you love. Work in worsted-weight yarn and features interweave cable panel pair with 6-sts cable rib that is perfect for both gender and kids. Serena is easily customize to fit each individual needs. Reese is a cable scarf and Beanie set is for all ages and gender. It’s a prefect gift for anyone or yourself. Reese Scarf measures 60″ x 8.5” and it can be widen or length depending on personal preference. It can also modified to turn into a cowl. Attached I-cord has applied to all sides of the scarf to prevent the side to roll inward. The attached I-cord also create a nice smooth side edging. Kaleido by Silkie B – Accessory 2011 is on sales now on Ravelry.com for $10 USD. If you are interested in this collection, simple click on the ‘Buy Now’ Button below and it will bring you to my Ravelry. If you would like to purchase any of the patterns within this collection, simple click on the design image that you like, it will bring you to the individual pattern detail page and you can purchase through there.